Posted by Jenny in nature, plants, White Mountains. When I maintained a section of the Carter-Moriah trail in the White Mountains, I always looked out, as I climbed, for the place where I would see my first black spruce. After passing through a forest of northern hardwoods and red spruce, I would emerge into a clearing below Mt. Surprise that offered views over to the Presidential Range and the great bald dome of Mt. Washington. On these rocky ledges with tufts of moss, lowbush blueberry, and sheep laurel, I was always able to spot a few small black spruce peeping out from under larger trees. Black spruce were the visitors from the north, the vast boreal forests. The map indicates that the range extends across Massachusetts, but in the years I lived there, I only saw a few isolated specimens in acid bogs—the only environment they care for besides northern latitudes and high elevations. And it’s true, this is not the sort of tree you would choose as the centerpiece of your front lawn. It is decidedly undignified in its appearance. 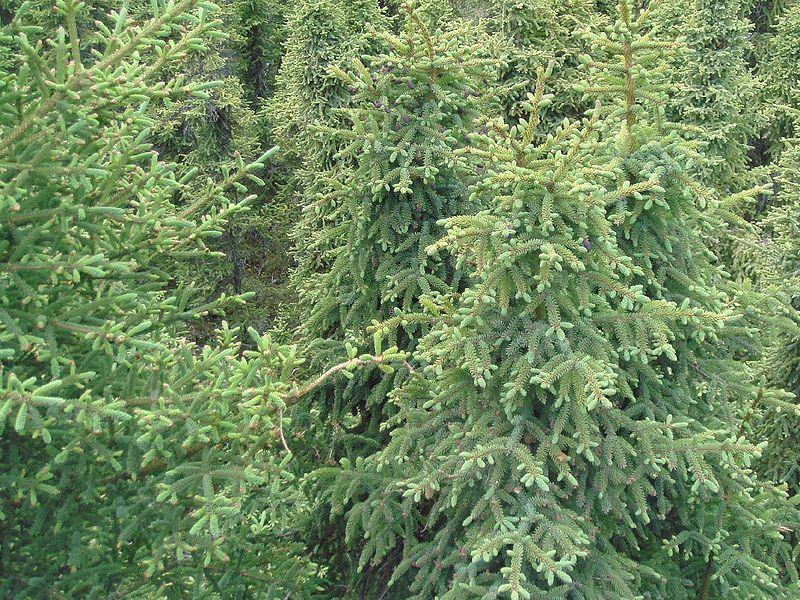 A dwarf form is sometimes used as an ornamental, but for a full-sized tree, landscapers prefer Norway spruce or Colorado blue. Yet black spruce is quite attractive when you look at it up close. Its small, delicate needles have a bluish cast more subtle than the garish turquoise shade of the hybridized Colorado. 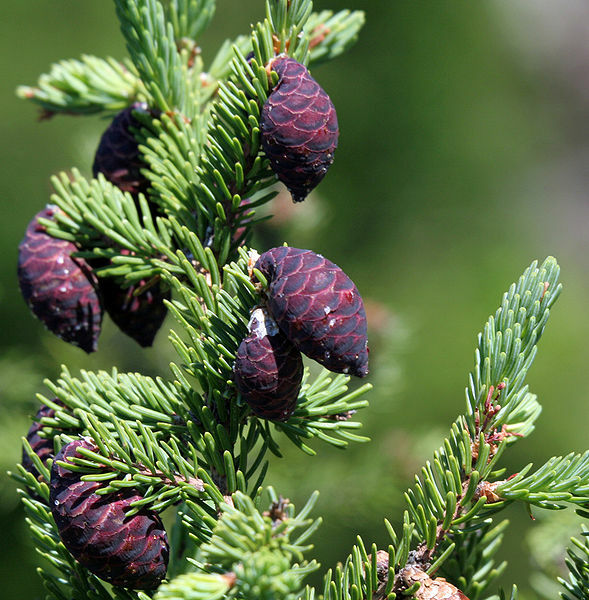 The cones are the smallest belonging to any spruce, growing in a crown of glossy, purplish-brown bundles toward the top of the tree, in the shape of miniature Christmas tree ornaments (see photo at bottom). The cones sport a tidy fish-scale pattern. In the arctic regions, the heaving of permafrost as it freezes and thaws sends these trees and other boreal species tilting and sprawling at angles far from a true vertical. This is called a “drunken forest.” I like to think of these slow, vast upheavals, seismic in their effect. This is larch, not black spruce, but it gives you the idea. This was taken in Siberia. Where I live now in western North Carolina, there are no black spruce and I am close to the very southernmost border of the red spruce range. If the Smokies were only a couple of thousand feet higher, I imagine I might find spruce sculpted into stunted krummholz shapes near treeline—and maybe a few black spruce mixed in with the reds, if they could miraculously make the leap across the miles. Posted by Jenny in hiking, nature, photography. 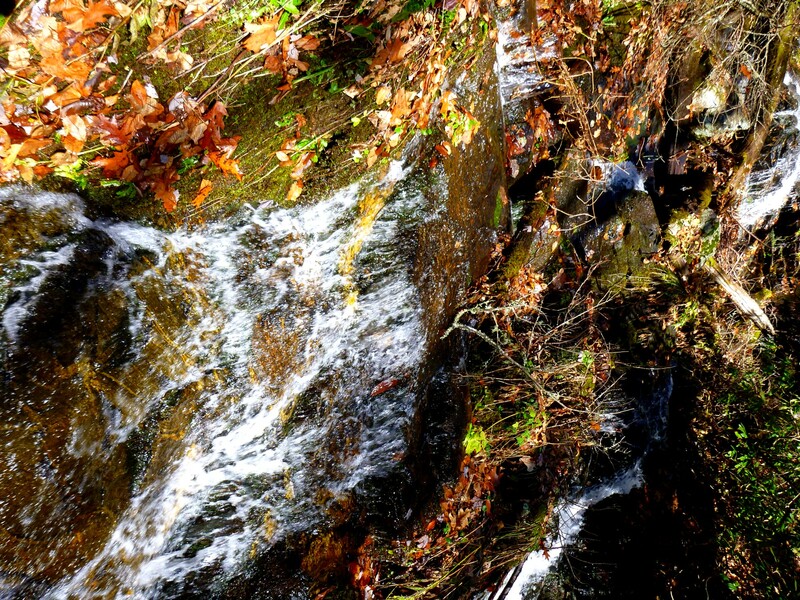 One of the nicest waterfalls that practically no one sees despite a location near a trail. 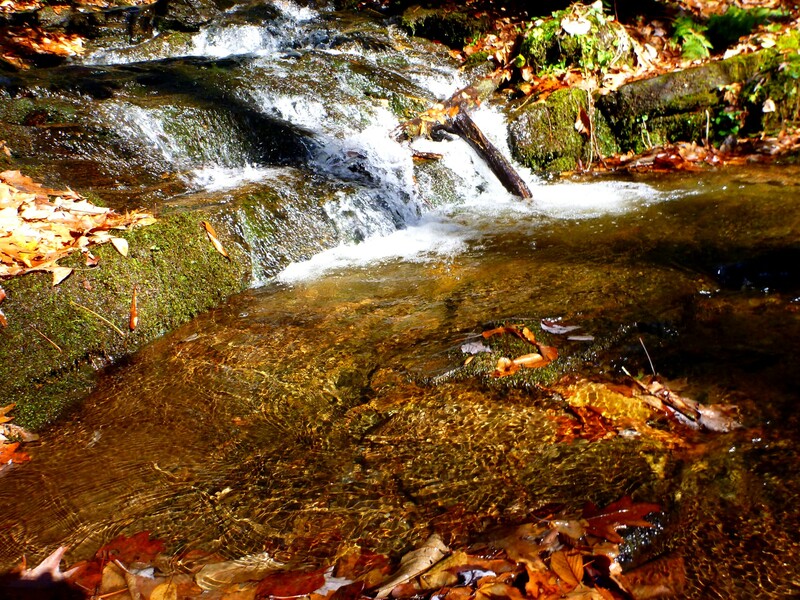 In the summer, you can hear the tantalizing roar of this waterfall from the East Fork trail in the Plott Balsams near Sylva, NC—but you can just barely make out its flowing line of water through the trees. Once you scrabble up the last tough little rubbly pitch on the trail’s most demoralizing section (600′ in a third of a mile), you will see a rough, unmarked side path that drops to the stream. 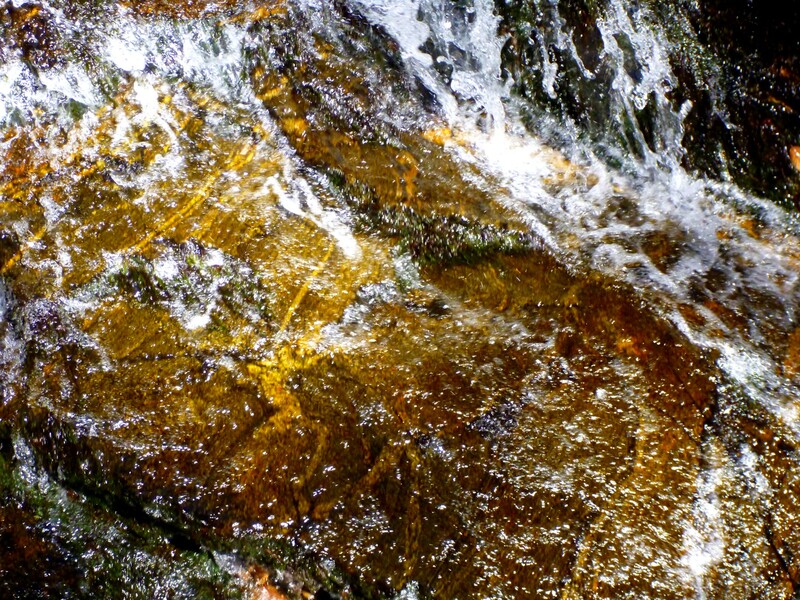 But it goes to the top of the waterfall, not the bottom, and what you see is water plunging over an edge. To get even the slightest view of the fall itself from that point, you need to hang onto a tree and lean out. It’s a bit dangerous. In the winter, you can see more of the falls from the trail. But with the leaves down, it also becomes obvious that you can make a short, painless bushwhack to the bottom. I visited the falls by this route the other day. I climbed up the trail, passing between what I call the “Rocks of Discouragement.” This is a spot where you’ve just done a steep climb, it almost levels off for a bit and you think life’s about to get easier, and then you look up and see it gets even steeper. 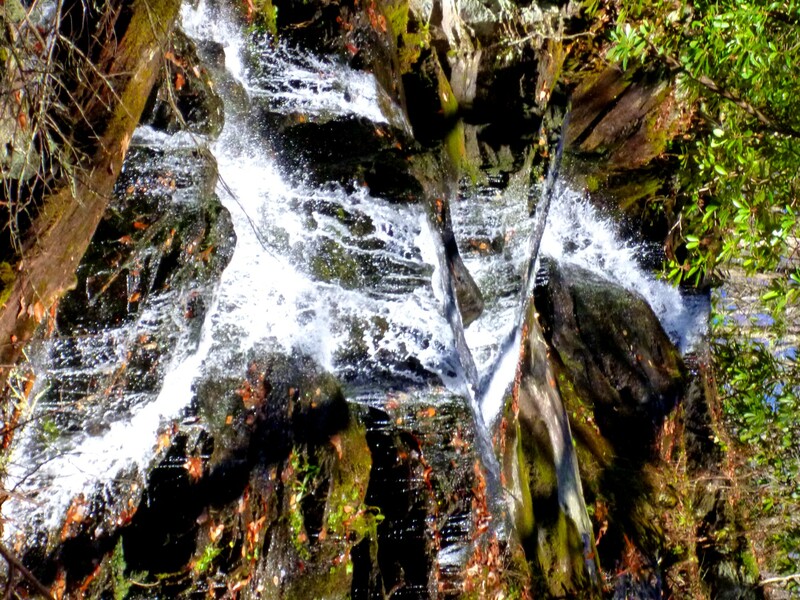 You see the water cascading down for hundreds of feet. This waterfall doesn’t ever really bottom out. Below the biggest drop, there are smaller drops going down and down the stream valley a long ways. 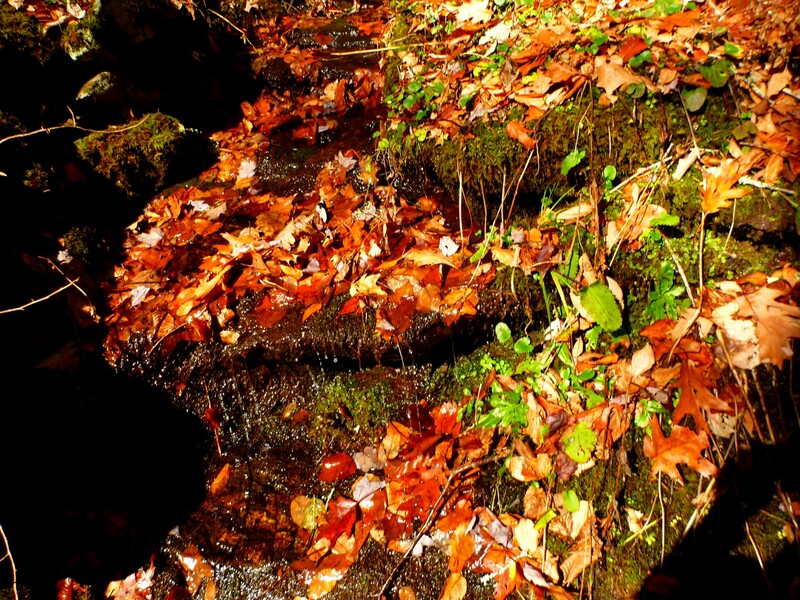 At a shoulder on the slope, you will see a place where you can contour around to the stream through open woods. Small falls just below the big falls. 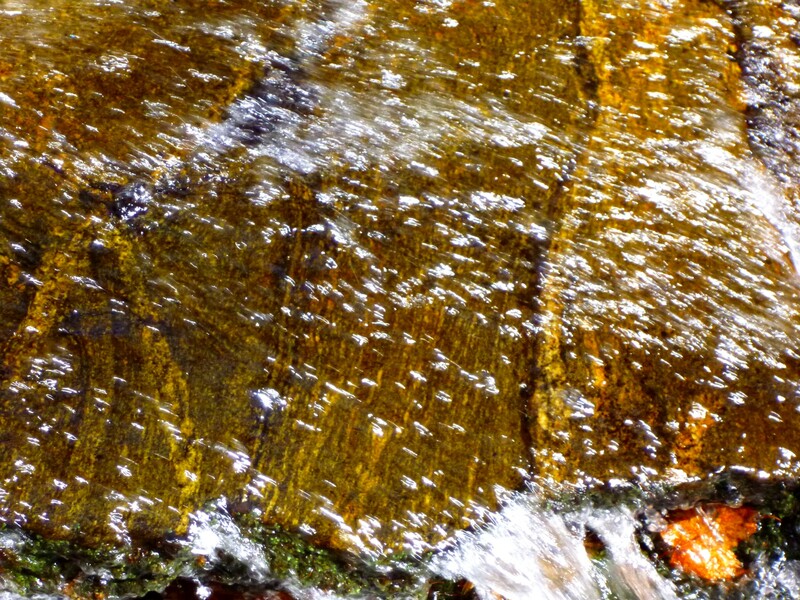 Splashing water droplets over rock. Medium falls below the small falls, and it just keeps going. Posted by Jenny in history, poetry. This poem is a pantoum. Deep in the interior, lines of smoke hung over the jungle. Civilization came in a volley of gunfire. past a black fringe of trees. Flags flapped above the settlement. He marked the location of a wide, silent lake. Past a black fringe of trees, flags flapped above the settlement. Nowadays, of course, the hotel boasts a generator. Violent lightning cleaves the skies over Juba. 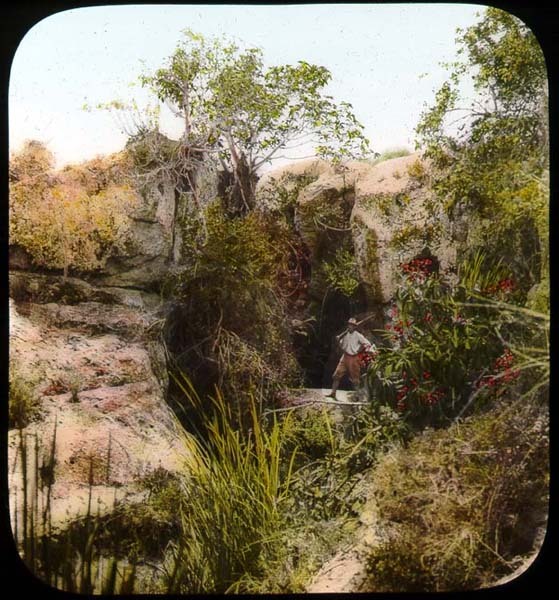 In the Nuba Mountains, families crouch in rock caves. Swarms of zebra ebbed and flowed across the blue plains. The animals succumb to the nightmare of history. 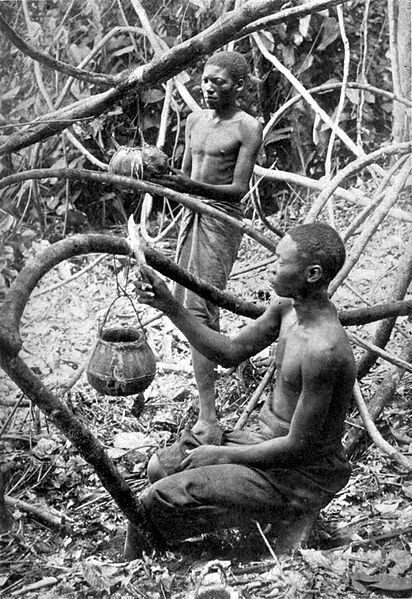 King Leopold ignored reports of rubber slaves. Company agents sliced off the rebels’ hands. Our steamer glided past the enigma of the coast.